Bitcoin price crashed drastically during the early hours of Thursday. In just one hour, Bitcoin dropped over 5% of its gains, falling below $6,100. Thereafter, the price retraced close to $6,300. What can we expect? Will the bears push the price further down? The price of cryptocurrencies declined sharply overnight. The price of Bitcoin, Ethereum, Ripple, and Litecoin all crashed by more than 5%. The number one digital currency, Bitcoin fell by 400 points while Ethereum, the second largest coin dropped by more than 22 points. The market capitalization of cryptocurrencies tracked by CoinMarketCap fell to $185 billion, which was the massive sell-off in recent times. Bitcoin Price Crash: What Happened? Trouble in the market began last week after ADP released their jobs report for the USA. The figures released reveal that the private sector had increased gains. The confirmation was made on Friday when the government data indicated that the rate of unemployment had dropped to 3.7%. As a result, a massive sell-off started by the US treasuries as traders started getting apprehensive about rising interest rates. How Was the Global Stock Market Impacted? All the US stock exchanges recorded huge losses in eight month-low, the lowest level since February 2018, as rising interest rates made investors to scamper for safety from risky stocks. The S&P, Dow Jones and Nasdaq index plummeted between 3 and 4 percent in a single day of trading. 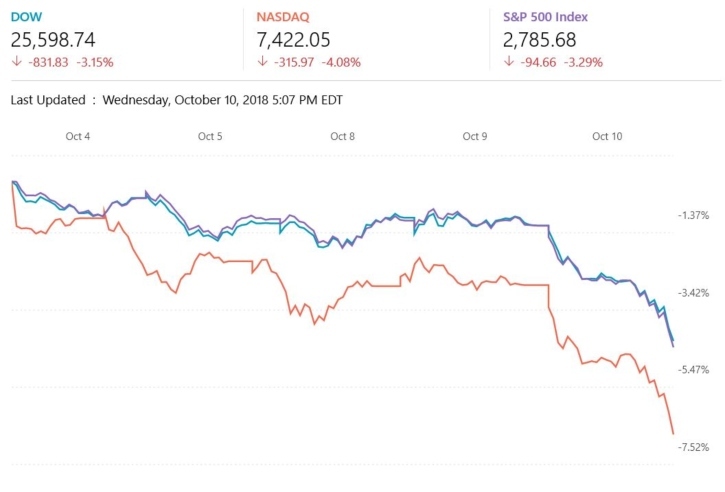 The S&P 500 lost almost 92 points, while the Dow Jones Industrial Average (DJIA) dropped over 800 points, making it the third worst decline in history. The Tech stocks were among the worst affected as Amazon, Facebook, Netflix, Apple, and Boeing lead the market lower. Whereas, FTSE 100 hits its six-month low, while Nasdaq Composite index plunged about 8 percent this month. The sharp sell-off in the US has likely caught no one by surprise. If anything, investors have been wondering how, in the face of the tighter monetary policy, a contracting labor market and rising oil prices, the US has continued to be so resilient. It is also worth mentioning, that this was not the first time that the crypto market corrected alongside the global stock market. Earlier in the year, February to be specific saw the two markets correct simultaneously. All of these made investors anxious that the rising interest rates would hinder the nation’s economic growth. The New York Times wrote Yesterday, that if the trade war persists, China could withdraw from buying US treasuries. Further, the decline of the crypto market somewhat erased the thinking that digital currencies could be used as a safe haven in times of increased risks. In the past, crypto enthusiasts have called Bitcoin a digital gold which traders rush to when risks increase. Yesterday, Hurun released its list of the wealthiest people in China. The list showed for the first time, that eight people were investors in the cryptocurrencies industry. Some of them were even the founders of Bitmain, Binance, and OkCoin. Moving forward, it seems that the camp of Bitcoin critics is growing. The American Association of Retired Persons published its glossary of Wall Street buzzwords with the following definition for Bitcoin. Bitcoin — A bunch of computer code that a bunch of criminals, idealists, and speculators agree is worth ‘real’ money. Sadly, its real-money value swings widely, making it impractical except for criminals, idealists, and speculators. Decentralization in crypto is a myth. It is a system more centralized than North Korea: miners are centralized, exchanges are centralized, developers are centralized dictators (Buterin is “dictator for life”) & the Gini inequality coefficient of Bitcoin is worse than North Korea. Nevertheless, the Twitter community responded, mocking his statement with sarcasm, which is hardly surprising. 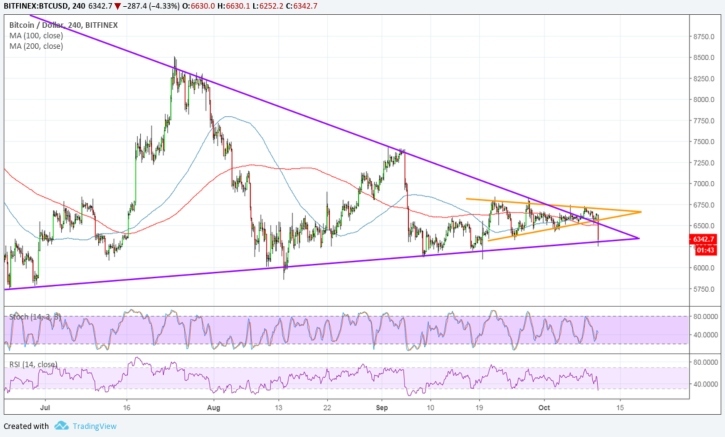 Looking at the technical picture, Bitcoin price seemed to have made an upside break from the long-term triangle consolidation but failed through a short-term triangle support. This performance brought the price back to the longer-term zone as the bulls seem to be defending this area for the time being. However, there is a possibility that Bitcoin price could hit $7,000 or higher if a breakout happens. But, if the bulls fail to sustain the momentum, the bears could drag the price down further toward $6,350 and $6100. Currently, the 100 SMA is above the longer-term 200 SMA which suggest that the path of least resistance is to the upside. Stochastic is also turning higher which indicates that buyers are trying to regain control. Nevertheless, Relative Strenght Index (RSI) shows that there is room to free fall before reaching oversold levels. That means the bears could continue winning for a bit longer.